CRAFTED FROM STRONG STAINLESS STEEL- These engraved luggage tags can last for years because we craft each one using durable and high-quality stainless steel material. INCLUDES A STAINLESS STEEL KEYCHAIN LOOP- Instead of a usual chain, we used a stainless steel twisted cable for the keychain loop. This ensures that your travel luggage tags wonâ€™t accidentally be removed. 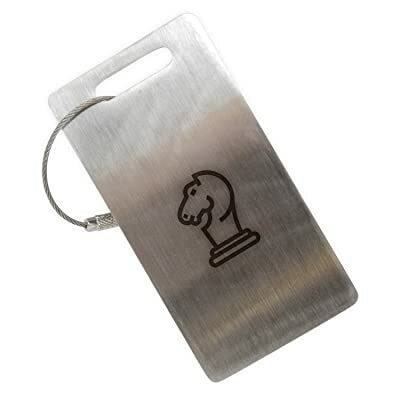 ARTISTIC LASER ENGRAVED CHESS KNIGHT DESIGN- A chess knight is laser-engraved on the front side of these hard luggage tags to add uniqueness to it. This black engraving looks great on the polished stainless steel background. EASY TO WRITE ON- At the back of the lightweight luggage tags are spaces where you can easily write information. You can use any marker and erase it with rubbing alcohol. LIGHTWEIGHT AND ADEQUATELY SIZED- These travel bag tags may be made of metal but they are lightweight and sized so as to be big enough to easily see the information.